After reading a recommendation from Legal Nomads, Jodi Ettenberg who is a total Foodie and lives much of the year in Vietnam I purchased the latest Vietnamese cookbook on the market Real Vietnamese Cooking, Homestyle Recipes from Hanoi to Ho Chi Minh. It is quite different to my Luke Nguyen cookbook and I enjoy both greatly. This book is written from the perspective of expats living in Vietnam unlike Luke's book who despite being Australian has Vietnamese heritage. Both books take you on a journey through Vietnam but look at it from different angles. On a recent trip to Costco I ended up with two tasty looking whole Snapper and was stumped on what to do with them. I wanted something different, I was tired of just cooking them whole with herbs and spices. 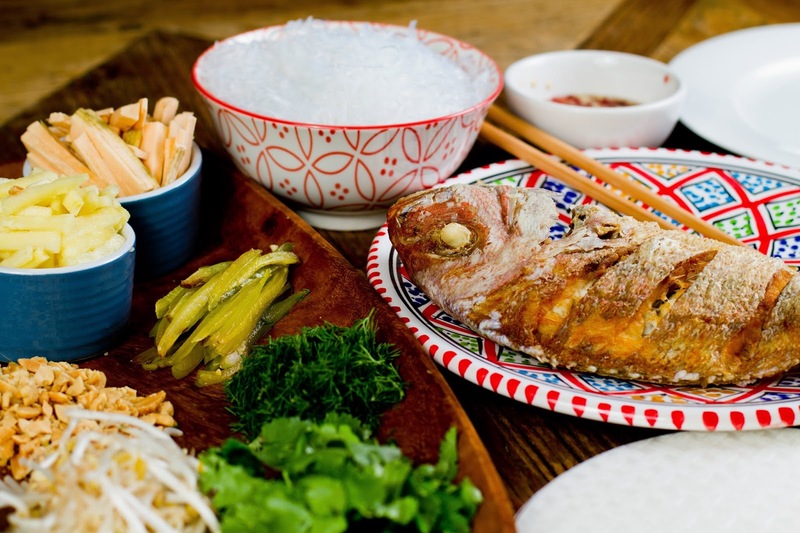 I turned to my new cookbook for inspiration and found a great recipe that deep-fried the snapper whole which I had never done before and then laid out a selection of ingredients a bit like when you do Tacos so you can make your own rice paper rolls at the dinner table. Ingenious. This particular recipe also used a number of ingredients I had never tried before like Star Fruit and Green Banana which was exciting. I really wasn't sure how fruit would go with fish but of course it was a marriage made in heaven, those Vietnamese know their flavours, simple, fresh and delicious. 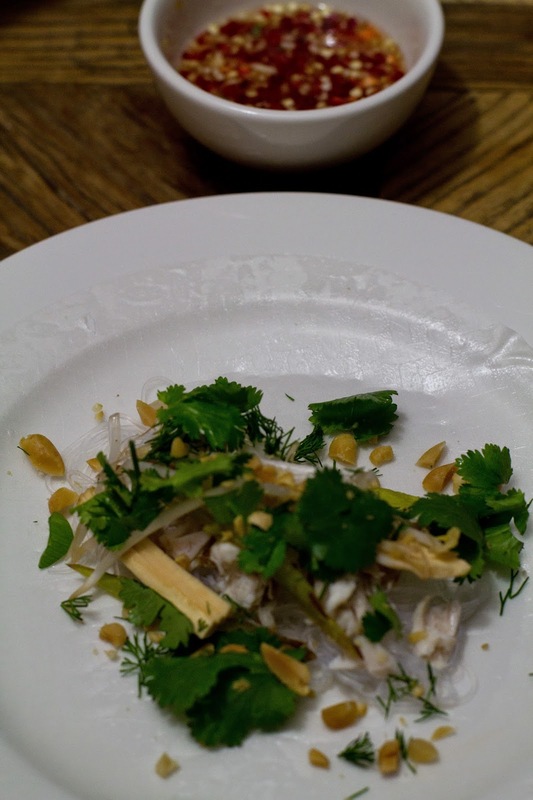 This was paired with a dipping sauce made with Lime, Rice Vinegar, Garlic, Chilli, Fish Sauce and Sugar. 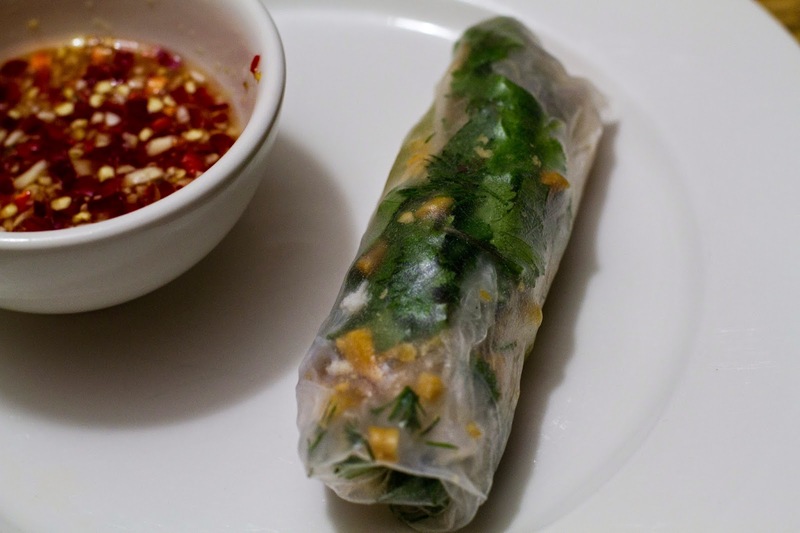 You will need a bowl of water on the table and some tea towels as guests need to soak their own rice paper, dry off and lay out ready to load up with ingredients and fold their own rolls. I love when a recipe gives you inspiration for the future. The basic concept could become a great week night staple dinner just like Taco's are in our house and they are so healthy. You could put anything you like in there. They would be so yum with prawns, mint and shredded carrot or what about marinated chicken with Vietnamese mint and cabbage. The possibilities are endless and the best part is that apart from chopping up the ingredients your dinner guests get to do the hard work disguised as fun.